Humba Recipe (Braised Pork Belly) is one of the comfort foods of every Filipino household. It’s a popular filipino food dish somewhere in the Visayas and Mindanao regions (I knew it because I used to lived from this two areas). I don’t know how they called it in the Luzon region, but I knew they have a version of humba too. Filipino recipes is really my favorite. 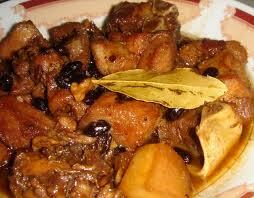 Humba is one of the dishes I prepared during our recentsalo-salo (get together) with friends. Everyone loved it. I even heard one of them that he missed it a lot. They were quite surprised upon seeing potatoes and hard-boiled eggs sitting on the dish. I’ve got this idea by my mom’s friend, a kusinera (a househelp main job is like a chef who cooks for the entire family household). Her Chinese style humba has a distinctive flavor that I can’t remember exactly how she made it. Maybe soon, I’llpost my Chinese style version. So, watch out for it! Combine all ingredients in a big pot and bring to a boil. Lower heat and simmer for about an hour or until pork belly or hocks is tender. You may wish to adjust the taste according to your style and liking. If you want to add some potatoes and hard-boiled eggs in this dish,potatoes usually cook about 15 minutes. It’s up to you whether you like it very soft or just tender to bite. You may add it halfway of the cooking time or later. As for the eggs let it sits for a few minutes before its done to let the sauces covered into it. Remove bay leaf and peppercorns (if used) just before serving. Serve hot.